It's a First Amendment issue. Federal Judge Naomi Reice Buchwald has advised President Donald Trump to mute Twitter users instead of blocking them. Buchwald is presiding over a lawsuit filed by the Knight First Amendment Institute at Columbia University in 2017 on behalf of seven people Trump blocked on Twitter. Based on the First Amendment, the government cannot suppress or restrict citizens’ protests and opinions on a public forum, so Trump blocking Twitter users infringes upon their First Amendment rights, according to the lawsuit. Trump blocking Twitter users prevents them following his feed or easily seeing what he posts. Muting is less restrictive than blocking, as muted users can still see Trump’s feed. “We’ve said from the outset that muting would be a less restrictive alternative than blocking, so we were pleased the judge raised this possibility,” Jameel Jaffer, executive director of the Knight First Amendment Institute, said to Motherboard in a statement. Judge Buchwald advised the two parties to work toward a settlement, but said she would issue a ruling if they could not. 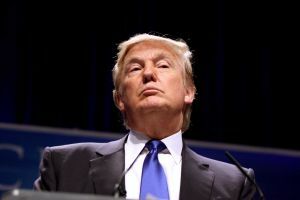 President Trump’s social media use is of particular concern not only because of his heightened status, but because it seems to exceed the boundaries set for all other government employees on social media platforms. Government workers have to adhere to a strict set of rules in regards to social media. This makes sense if they are communicating from an official platform. However, many public figures have to continue operating under these restrictions throughout their careers and lives post-public office. This is the first time that a president has used Twitter extensively to communicate government action to the public, and it is forcing the U.S. to look more closely at what is or is not constitutional online. While muted Twitter users can still see President Trump’s feed, he will never see their responses. Though less restrictive than blocking, muting would still hinder citizens’ ability to fully voice concerns to Trump on the platform he seems to use the most. This is murky new territory, but it is important that we explore it. Social media appears here to stay, and we must solidify how government employees can use these platforms and what actions on them do and do not infringe upon citizens’ First Amendment rights.